Our classic and antique style wall mounted corkscrews and wine bottle cork openers are handmade by European artisans from solid brass alloy. Artistic looking and traditionally operable with a crank and lever, our mountable cork openers are manual operated into which a traditional twist and pull corkscrew is hinged to gracefully open a corked wine bottle. Such a wall mounted corkscrew does make a real legacy gift for any wine enthusiast and are great functional decor addition for wine cellar or tasting room, restaurant or wine bar and why not, even a home kitchen. Also on offer is our unique, 'twist and pull', pocket sized 'cork drawer' tire bouchon that makes a small yet thoughtful gift for any avid wine enthusiast or corkscrew collector that can be discreetly kept in a pocket and drawn at the right moment to open your finely corked wine bottle. Whether at home, in a cellar, kitchen or at a classy restaurant, uncork a good bottle of wine in style with one of our hard to find wine bottle cork openers. Though produced in limited numbers, we are pleased to introduce internationally this exclusive collection of handcrafted wall hanging corkscrews and wine bottle cork extractors. 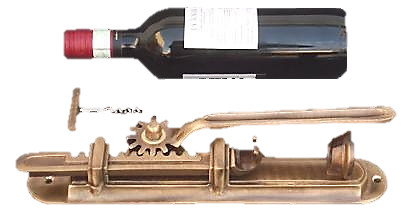 The WBF305 Brass Made, Wall Mounted Corkscrew is a rustic replica of an antique wine bottle cork opener used at centuries old vintage French cellars. 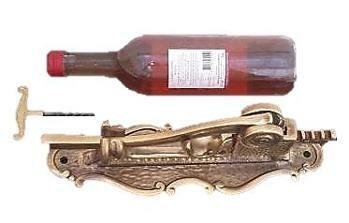 Artisan made in massive brass, this wall hanging wine bottle cork puller is polish finished and weighs more than 3 kilos. Mountable and a lever and crank operated corkscrew that would make a stunning addition to any wine cellar, tasting room, wine bar, restaurant and kitchen. No less impressive is the WBF107 Classic, Brass Made Wall Mounted Wine Bottle Cellar Corkscrew that comes in a 'Bronze like' finish and weighs more than 2 kilos. Definitely an enhancement to any wine cellar, tasting room or a classical kitchen and an outstanding anniversary, wedding or heirloom gift for any wine enthusiast! A must have for any helixophile! This 'handy' yet elegant 4 inch long WBF308 Pocket, Wine Bottle Cork Puller is no larger than a small pen and weighs just over 100 grams. Once this brass made 'cork drawer' cap is unthreaded it can be inserted into the corkscrew's top part to function as a traditional, twist and pull corkscrew. Such concealed cork puller 'pen' is bound to be a great gift idea for any avid wine enthusiast! We can supply the above brass cork screws to Traders, Individuals, Wine Bars, Restaurants and private individual in: Northern America - Canada, USA, Europe (United Kingdom - England, Scotland, Wales, Northern Ireland - Austria, Andorra, Bulgaria, Belgium, Denmark, Croatia, Czech Republic, Cyprus, Eire (Ireland), Finland, France, Germany, Hungary, Greece, Iceland, Italy, Latvia, Luxembourg, Lithuania, Liechtenstein, Malta, Monaco, Norway, Netherlands (Holland), Poland, Portugal, Romania, Sweden, Slovenia, Switzerland, Slovakia, Spain & Russia , Middle East (Israel, Dubai, UAE ), India, Asia (Japan, South Korea, Singapore), Australia and New Zealand - Caribbean, Americas - Trinidad and Tobago, Bahamas, Barbados, Bermuda, Mexico, Puerto Rico, Antigua and Barbuda. Private Orders: Subject to availability, these small pocket, cork pullers and Wall Mounted, Wine Bottle Cellar Cork Screws are generally available for Private Individuals and resellers in single or small quantities internationally. About Renaissance Arts Company Limited: A Malta - European based stockist and supplier of a wide range wine related gifts and accessories, corkscrews and garden brass fittings to Wineries, Distilleries, Wooden Barrel Makers, Decorators, Traders and Individuals internationally.